Today we released an interface update of the main screen – we made it cleaner, lighter, eliminated some clutter and adjusted it to fit better the modern screens – like using bigger fonts and more spacing. Besides the design changes, we added some new functionality. Now the Search function searches in real time, suggesting the items found right away. This function also replaced the old “jump to project” dropdown. 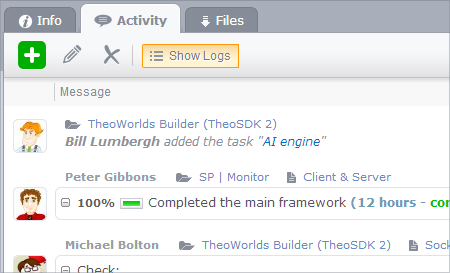 Also, we added one big feature – the display of user logs in the Activity panel. It is turned off by default, but you can turn it on to see not only messages and files people posted, but also the actions they did, like posting a project, editing a task, etc. We hope you like the updates and find the new features useful. User logs is a very useful feature, BUT why do the logs only go back a few days or entries? Logs that were there one day disappear the other day. yes i meant the 7 day period in which they are stored not the ones on the earlier pages. can this 7 day limit be raised? it is very useful to have logs and usually 7 days are enough if one constantly monitors them, but after one week vacations i have no chance to see changed pages in this duration. I suggest at least a 30 day period of logged events if not an indefinite one. Previous post: Social Toolbar released!